For noir fans walking into the Roxie Theater on Thursday, March 19, it will be as if they have merely been on an absurdly long intermission. Last November, Elliot Lavine and Don Malcolm packed them in with their “The French Had a Name for It” Gallic noir series. Now, they are back with “A Rare Noir Is Good to Find: International Film Noir 1949-1974” and beginning exactly where they left off, with the French. Robert Bresson’s 1956 spare, methodical, prison-break classic A Man Escaped (Un condamné à mort s’est échappé ) opens the five-day series. There’s Always a Price Tag (Retours de manivelle ) completes the double bill, a 1956 crime drama in which Daniel Gélin plays an artist who discovers too late that no good deed goes unpunished when he saves the life of a dipsomaniac lawyer (Peter van Eyck) who promptly ensnares his savior into the endgame of his war with his ice queen wife (Michèle Morgan). Star Stathis Giallelis appears at screening on Jules Dassin’s 1974 rarity The Rehearsal . 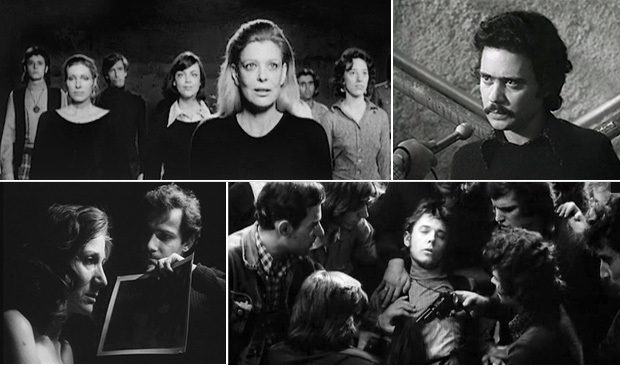 The Rehearsal (I Dokimi ) (1974)—The most contemporary film in the program is a little-seen political thriller from the great Jules Dassin (Thieves Highway , Night and the City , Rififi ) that stars the director’s wife Melina Mercouri, Laurence Olivier, Arthur Miller and Olympia Dukakis in a tale spun from the 1973 Greek military’s murder of Athenian students. The Rehearsal was not available for review, but Dassin’s name attached is enough for a recommendation. This is also the only movie in the series with a live-and-onstage guest. Co-star Stathis Giallelis will appear in conversation with Brooklyn College professor Foster Hirsch after the Sunday, March 22, screening. Noir gets musical in Tian-Ling Wang’s 1960 Carmen tale Wild, Wild Rose . 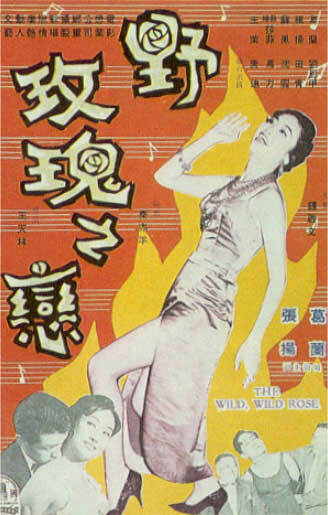 Wild, Wild Rose (Ye mei gui zhi lian) (1960)—It’s Carmen gone not just noir but also Hong Kong in Tian-Ling Wang’s musical melodrama that relocates Bizet’s story to the seedy world of bars and nightclubs and transforms the opera’s soldier into naïve pianist Liang Hanhua (Yang Chang) hired to accompany wild child singer Deng Sijia (Grace Chang). Lavish musical numbers embroider this tawdry tale in which Sijia becomes the instrument of Hanhua’s ruin when she makes a bet that she can steal the musician from his goody two-shoes fiancée Wu Suxin (Feng Su) in 10 days time. Giving this offbeat noir more emotional heft is the realization that while Sijia comes across like the classic, cold-hearted femme fatale, in reality, like Jessica Rabbit, she’s only drawn that way. 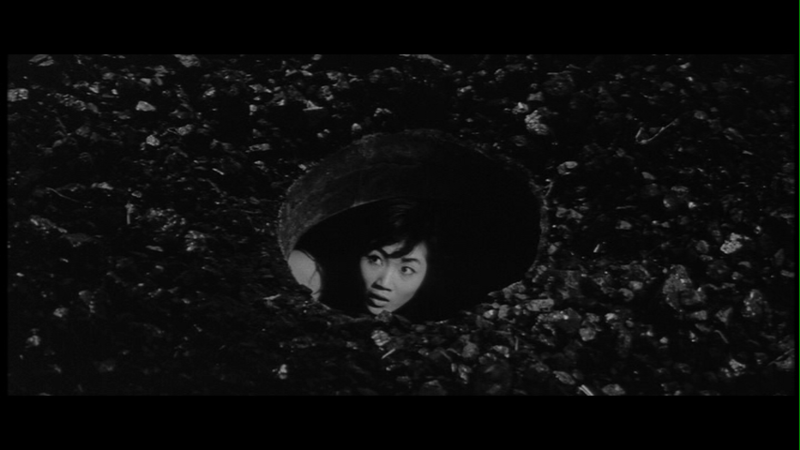 Underworld gets literal in this moment from Seijun Suzuki’s Underworld Beauty . Underworld Beauty (Ankokugai No Bijo ) (1958)—There is no honor among yakuza in this relatively sane thriller from the often-flamboyant Japanese auteur Seijun Suzuki (Tokyo Drifter , Branded to Kill ). Fresh out of prison Miyamoto (Michitaro Mizushima) wants to make things right with Mihara (Toru Abe), a confederate seriously wounded on his last, ill-fated job by recovering hidden stolen diamonds and giving the money they will raise to Mihara. But when Miyamoto involves his old gang in the sale, the transaction takes a violent turn. Keen to save his own skin; protect Mihara’s ungrateful and out-of-control teen sister, Akiko (Mari Shiraki); and extract revenge from those who have betrayed him, Miyamoto’s lone wolf goes to war with an entire platoon of yakuza. The tension never lets up and the intricate plot commands the viewer’s attention in a tale that really is a thing of gritty beauty. Blond and beautiful Ib Mossin is the bait in 1957’s Sin Alley . 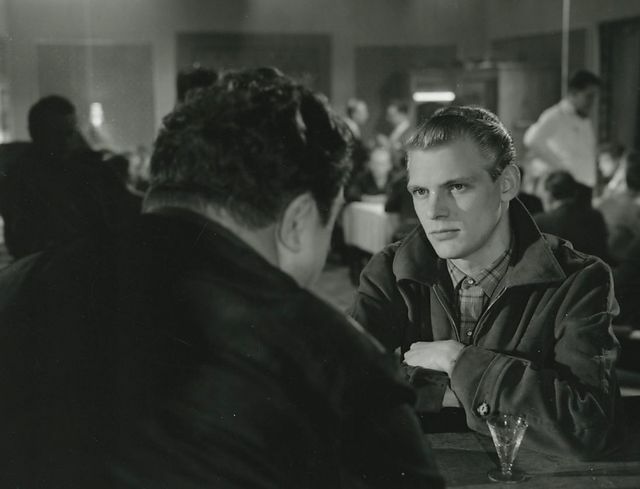 Sin Alley (Bundfald ) (1957)—Postwar Denmark is a bleak place for its jobless youth in this sordid thriller. Seventeen-year-old Anton (Ib Mossin) left rural Jutland for better opportunities in Copenhagen, hoping to apprentice as a carpenter. But times are tough in the big city, too. By the time he meets the predatory Kaj (Bent Christensen), he’s desperate and falls in with the other boy’s predatory scheme: Blond, strapping, and beautiful, Anton is the bait dangled at gay men. Kaj and the moronic Egon (Preben Kaas) follow Anton and his “dates,” and at an opportune moment, beat and rob the mark. What could possibly go wrong? A unique portrait of one subterranean world preying on another, Sin Alley also offers a vivid depiction of criminality born out of hopelessness. 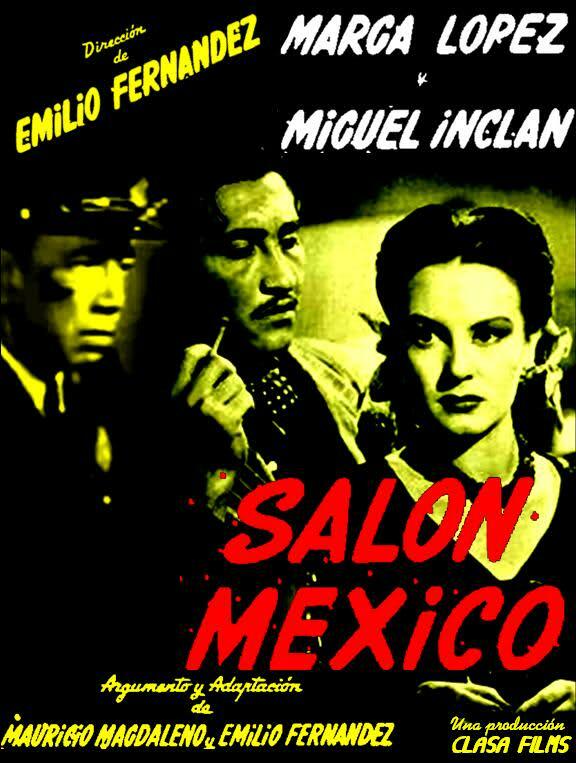 Salón México (1949)—Mercedes (Marga López) is a spiritual sister to Fellini’s Cabiria and Fosse’s Charity, a prostitute with a big heart, but her dreams of a better life aren’t for herself, but for her teenage sibling Beatriz (Silvia Derbez). The girl doesn’t even know the sacrifices that Mercedes has made for her. Mercedes intends to keep it that way, especially when it becomes apparent that Beatriz will have the opportunity to move up in social class. But Beatriz’s chances rest on the world not discovering the truth about Mercedes. A kindly cop (Miguel Inclán) wants to help and make an honest woman of her someday, but her lover and pimp Paco (Rodolfo Acosta) is determined to keep her down in the muck with him. A social conscious noir, Salón México makes much of the distinction between the underworld where Mercedes operates and the tony private boarding school where she has stashed Beatriz. Monday through Saturday, Mercedes’ universe is her slum apartment perched at the top of a high flight of stairs and the titular nightclub where she plies her trade as a “dancer” and good-time girl. Sundays she spends with Beatriz, taking Mass at the Cathedral and otherwise observing the more comfortable Mexico City denied her. Emilio Fernández’s crime drama is a terrific evocation of a life lived on the margins with few—if any—avenues of escape. March 19-23. Roxie Theater, 3117 16th St, SF. (415) 863-1087. $12 ($50 for festival pass through TicketWeb). For more info go to midcenturyproductions.com and roxie.com. 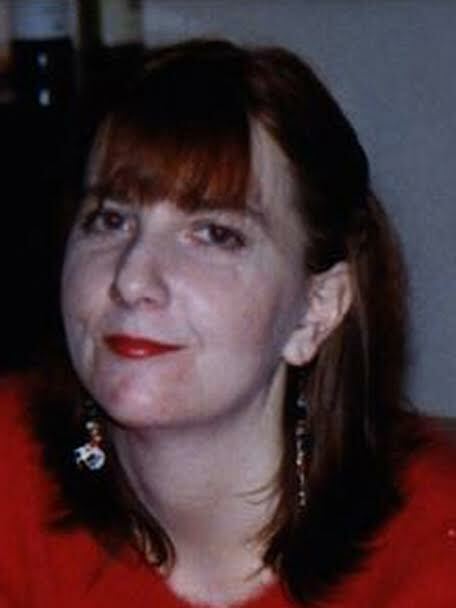 Pam Grady is a San Francisco-based freelance writer whose work has appeared in the San Francisco Chronicle, Box Office, Keyframe, and other publications. She is a member of the San Francisco Film Critics Circle. This entry was posted in Columnists, Films, Films: Festivals, Films: Noir, Films: Reviews and tagged film noir, Films, Pam Grady, Roxie Theater. Bookmark the permalink.